Solar lights are a cheaper alternative to electrical fixtures, especially for an outdoor space like gardens and yards. Here we discuss the pros and cons of using solar lights to help save money on more expensive lighting. Solar lights are commonly used for lighting external landscapes and are commonly seen in homes with either gardens or yards. They generate their own power source through solar light, which is why you see them used so frequently in gardens. During the day, they charge up via the sun and they release that stored up energy during the night. As with any product, there are a number of pros and cons to solar lighting. While the pros largely outweigh the cons, we’ll be going over both so that you understand the benefits and limitations of solar lighting. Easy to install – Solar lights don’t require an electrician to come in and install. Anyone can purchase solar lights from their local hardware store and install them as they see fit. Unlike traditional electrical fixtures, solar lighting is wire free and it’s just a matter of where you want the lights placed. 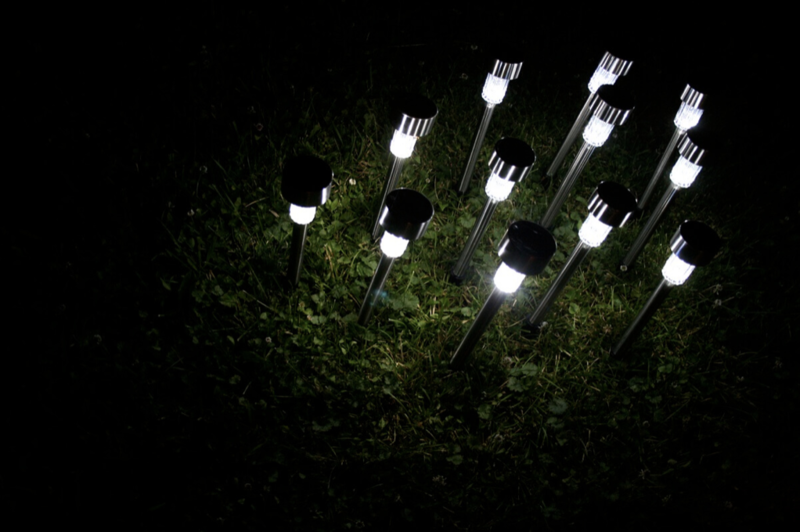 Solar Powered – As the name suggests, solar lights are powered by the sun. They charge during the day and turn on during the evening. They can even charge during overcast weather. Eco friendly – Energy consumption is one of the many contributors to our changing environment. Solar lights are a sustainable and green alternative to other electrical fixtures as they generate their own electricity through a renewable source. Cost effective – Solar lights are cost effective as they have zero operating costs. You are simply paying the one-off cost for the product and that’s it. Compare power prices with other electrical fixtures and you only have one winner. Convenience – Solar lights just work and require little maintenance. Once you set them up, they are ready to go. Brightness levels – The average brightness level of solar lights may not be adequate for some. However, there are more expensive options which can satisfy your required brightness levels. Some solar lights can be too blue – The colour saturation of some solar lights can be too blue for some. Some LEDs have a natural tendency of being blue which may not fit the outdoor landscape. However, there are options available with whiter lighting that most people prefer. Weather dependent – While solar lights can charge during overcast weather, this can take longer and is not recommended for long-term usage. If you live in a place that does not receive much sun, you may need to purchase a light with a larger charging panel. Also, seasonal changes can impact charging ability. Cheaper alternatives can be fragile – Cheaper solar lights may not last long and be very fragile. They may also take longer to charge as they are made from cheaper materials. Do your research before you purchase! Solar lighting is a cost-effective and environmental way of lighting your outdoor spaces compared to traditional electrical fixtures. If you are looking for ways to reduce your electricity bill and light up your outdoor landscapes, consider solar lighting. If you have electrical bills on your mind, compare power companies in New Zealand and see if you are getting the best possible price.